They’re not just support cells, astrocytes play an important role in memory and learning according to a new Cell Stem Cell study. Steven Goldman and colleagues derived neural progenitor cells from human induced pluripotent stem (iPS) cells and then transplanted these cells into the brains of newborn mice. 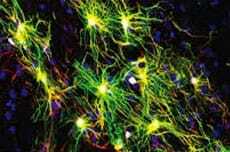 While most of the cells remained immature, some developed into astrocytes. These brain-cell endowed mice demonstrated superior maze-solving skills and recognized objects in new locations compared to non-chimeric mice. This study could help clue in neuroscientists to the evolution of astrocytes and their role in the human brain.